LOST: Final Season Premiere Date Set!!! 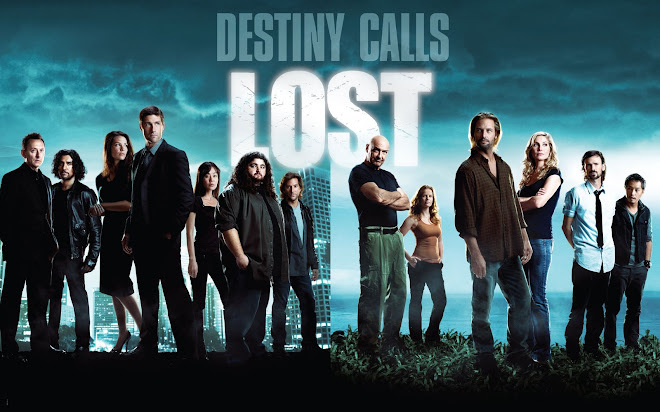 Well my fellow LOSTIES, we've seen Wednesday as the home for LOST for much of the show's run. During the strike-ridden season, we moved to Thursdays in a cushy slot after Grey's Anatomy. And now? LOST will travel to the most competitive day in the Winter/Spring months. Yes, it's Ellen and Simon vs. Jacob and Jack! LOST moves to Tuesdays! The 3 hour premiere event will take place on Tuesday February 2nd, 2009. (8:00 Eastern Time - 1st hour a recap show followed by the 2 hour premiere entitled "LA X" at 9:00pm Eastern Time). The regular time slot will be at 9:00pm as well. On paper? Awesome! Pair up the 2 Sci-Fi shows of V and LOST and give the geeks their day! But for bloggers like me? This is going to be the apocalypse! Clearly, LOST is my top concern when it comes to blogging, but I do have a soft spot for Idol and feel the need to bash the upcoming season with their newly crowned celebrity judge. Since this news is just breaking now, I don't have it all figured out. But I will! If Idol has to suffer shorter blogs this season, then so be it! This is a time for celebration, the show that has defied all formulas and defined a new generation of TV is entering its final season. And we now we know when "The Beginning of the End" will occur! How does everyone else feel about LOST on Tuesdays? Are we ready for it?! Hey LOSTIES, it's been awhile since I posted something new so I thought I'd get in touch with everyone like me still trying to get through this hiatus. I thought I would share some tidbits in case you haven't been keeping track. I also watched V last night and wanted to share some quick thoughts on the Pilot. Enjoy! Still got a little teary eyed right? So not much to do in analysis, just enough to get us amped up for January. Hopefully, we'll get some other promos before then. So, with that, I just wanted to get into traditional bullet form and go over some of the things I've heard about the final season. I'll note SPOILER where I think it is necessary! Season Premiere date is looking like January 20th. Due to the success of the 1-2 punch of Modern Family and Cougar Town, the timeslot is pending. 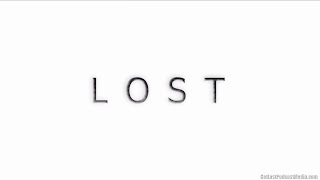 Since LOST will not be growing many new viewers for the final season, I along with many critcs and analysts are guessing it will get the Wednesday 10:00pm slot. Of course, on January 20th, it would be safe to say we'd have a 9-11pm premiere! Check out this interview with Damon Lindelof on USA Today's Pop Candy. Damon always is an intriguing interview. And if you're familiar with the podcasts he and Carlton do, then you should know that they stay away from ruining the show for us with major spoilers. They just bring things up that challenge us to think or explain what they will or won't possibly cover in the show. Don't forget Season 5 Blu-Ray/DVD comes out December 8th. You'll need the Blu-Ray to attend your Lost University Classes. And if you're planning to do that, you should enroll now! Here's a great interview with Elizabeth Mitchell (Juliet) and Executive Producers Damon Lindelof and Carlton Cuse. SPOILER WARNING: Very revealing information is revealed about Juliet, so don't say I didn't warn you! 3 - What Kate Does - Kate centric episode and a play on words from Season 2's episode "What Kate Did" when we found out why she was on the run from the law. Is this a hint towards a reset? One would think so, but it seems too easy doesn't it? 4 - The Substitute - Rumor this is a Locke-centric episode. Which makes sense considering Locke wasn't as he seemed in the Season 5 finale. And "the substitute" sounds like something we might like to know more about! 6 - Sundown - Rumored to be a Sun-centric and still following season 1's centric episodes formula. Got me on the significance of the title besides having Sun's name in it. Hopefully not spoiling that she dies in the episode. Seems too literal! 7 - Dr. Linus - Ahhhh, should have been a Charlie centric episode right? If we were following season 1. But we know he's not a series regular. He is most definitely returning for the final season but we still don't know in what form. But this sounds very BEN-centric. The doctor part? got me. He did remove a bullet from Sayid and sew him up. But a doctor? eh who knows. There have been some interesting castings over the past months. More Deadwood Alumni, And some legendary Japanese actor will be playing recurring roles. You can read through the comments on the last relevant LOST Blog posting to catch up if you like! Returning CAST: Well from Damon's interview, it's sounding like we're not going to get Libby to return in person. The actress Cynthia Wattros (sp) has a conflict or something. But Damon is confident, due to fan outcry, that they will be able to explain why she was in the institution at the end of the season 2 episode DAVE without her being there. Sounds like they wanted to get the actress back that played the older version of Rousseau, but she is booked on something else overseas. That is not cool! But I'm confident they can find a way around it. As for everyone else that has died on the show? We have some confirmations of appearances: Ian Somerhalder (Boone), Maggie Grace (Shannon), Dominic Monaghan (Charlie) to name a few. My guess is that we'll be getting appearances from a majority of past cast members as they try to complete this story and close some loose ends. So I would think we would see Michael and Walt, maybe Eko (who wants to come back supposedly), Charlotte? (maybe), Daniel Faraday, Seth Norris (the pilot and Matt Parkman on Heroes), etc... Why Walt isn't in the season 6 "FINAL SEASON" poster? Damon says everything on that poster is intentional, so that will be interesting. But they also said they need to explain Walt's "special powers" I would think he needs to come back. Any thoughts out there on this? Just watched "THE MAN FROM TALLAHASSEE" Episode again. And I have gone back and fixed every single blog posting where I said that Ben asked TOM to get the Man from Tallahassee. Someone even corrected me on a blog and told me it was Richard and I refused to back down! Well, I am finally saying I definitely messed it up! It was Richard. Does this change anything for me? Maybe. Maybe Richard has the ability to come and go from the Island that quickly. But Tom also has said that some of them can come and go freely. But here's the thing that makes it interesting that it was Richard. A BUS out of nowhere killed Juliet's ex-husband and Richard was around for that. Anthony Cooper was suddenly in a crazy car accident and all of a sudden was on the island (or something like that). Seems to be more of Richard's style. Interesting right? I've been watching these episodes with the mindset of trying to link the Smoke monster to the Man in Black or Jacob. And it is very interesting when you do this. Especially with the Christian Shephard appearances and the Yemi appearances. When the smoke monster kils Eko and Eko tells Locke "You're Next" even though he interprets it as "We're Next". Brings a whole new meaning! I don't think I ever put 2 and 2 together that Kate convinced Cassidy to call the police and put Sawyer in prison to serve time for his LONG CON. Maybe I thought it at the time, but never wrote it in the blog. Nothing too crazy theory-wise but a nice detail! Last and definitely not least, I am realizing how much I originally enjoyed season 3 and how underappreciated the season was to most critics and even some casual fans who abandoned the show after those first 6 episodes in the cages. On rewatchability, it seems more like season 2 suffers because that shows more of the holding pattern that LOST was in until a finite ending date was decided. Still a top notch season, but 3 is up there as some of the finest TV that has ever aired. And no one argues that the S3 Finale THROUGH THE LOOKING GLASS is one of the best season finales in memory. And still battles in my mind with The Constant for best LOST episode ever. Okay, enough LOST talk for now. If I get any more news on the season premiere and a longer preview, I'll be sure to post it. But let's switch gears now and talk about last night's V! I was 5 years old when the original V Mini-series aired on NBC. But I do remember watching parts of it, probably more V: The Final Battle than the original mini-series. I remembered aliens lizards disguised as humans, eating rats, eating humans and I remembered that I loved it! While they didn't show us if they still like consuming US yet they didn't let me down on showing us their reptilian side. They didn't even need to sign on Elizabeth Mitchell to make me want to watch this show, but it certainly didn't hurt! Good things about the episode? Production Quality. It was pretty top notch on the original but obviously dated. Both the V and FlashForward pilots had some great special effects and CGI to make their stories very epic. We were able to see these Spaceships hovering the major metropolises of the globe and make the threat seem very real thanks to today's technology. And I'm glad there was at least ONE Independence Day reference. Good times. The Acting - One thing FlashForward gets knocked in is having a great premise with some lousy on-screen chemistry and dialogue. I'm not really seeing it just yet. But V clearly has some top notch acting in it and it will be one of its strong points going forward. It doesn't get any better as Elizabeth Mitchell being the protagonist of the story. Strong female lead and a whiny teenage son. I'm sure they will not be seeing eye to eye about the VISITORS any time soon. And did I sense some chemistry between the Priest Jack (11/9 Thanks MJ for reminding me he was in The 4400) and Erin (Mitchell)? Perhaps he will abandon his faith due to the Visitors? Eh, probably not but we'll see. And of course, always good to see another Party of 5 member back on TV! Scott Wolf as the Reporter that is being used by the V's to spread their message of "GOOD". Kind of reminds me of the role Gaius played on Battlestar Galactica with the Cylons. (Don't spoil me though, I'm only wrapping up season 1! I know...way behind on that one). There's more but I'm just touching on it briefly! The Premise - by the end of the episode we learned that the V's have been on the planet for quite some time but the "FINAL PHASE" has just begun with announcing their arrival. Most of the planet is under their spell of coming in peace but there has been an underground rebellion for years preparing for this day. They recruit new members in Erin and Jack. Erin even finds out her sort-of FBI partner Dale is one of the Visitors. I guess I should say was since she managed to kill him. News flash though, these crazy V's CLONE human skin so it's looking like we'll see the actor Alan Tudyk (Firefly/Serenity (thanks again MJ), Death at a Funeral, Knocked Up, and of course Pirate Steve from Dodgeball) again! Oh right, then we have the group of V's that are GOOD GUYS! Like Ryan Nichols who is in love with a human Valerie Holt and was going to propose to her. But now that he knows he has to fight the good fight, he does not want to endanger her. And of course, she doesn't know he's a V! Did I mention Erica's son is in love with one of the V's? Definitely some nice subplots already set up. And that's all I have for now. Anyone else doing a LOST rewatch out there? How far in are you? Any discoveries you'd like to share? How have you been spending your hiatus time? Feel free to comment below. Like I said above, I will definitely post again whenever we get some definitive LOST information. And be sure to check back on the comments as I, and other commenters sometimes add useful links to LOST goodies! See you in the near future and NAMASTE! Check out the new FlashForward Addicts Blog! Hey Losties! Did you catch FlashForward on Thursday night? It was awesome wasn't it? Just thought I'd let you know that I have started a new blog and will also be recapping the episodes for this show. Click the link below and come on over to join in the discussion of this potentially great new show! Lost Season 6 Premiere Episode Title Revealed? Kudos to Doc Artz for posting the discovery on Twitter. So... "LA X" is the supposed title of the Season Premiere. What could it mean? Could X be the unknown variable (as in the episode title from season 5 which Daniel said he forgot about when he was focusing on Constants?) As in Solve for X? Yeah, I'm going off on a limb there! In any case, I thought it was worth posting and would love to hear your feedback! Follow me on Twitter for continued updates! Stay tuned for more updates and speculate below on what you think of the Season 6 Premiere Title. NAMASTE! I have been keeping myself busy over the past couple months (wedding, new house, you name it! 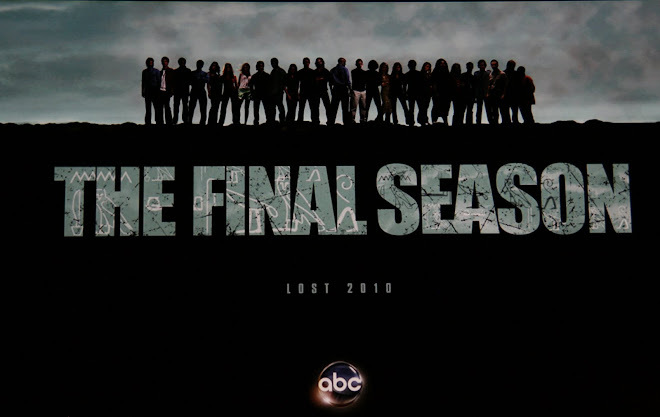 ), but with us months away from the final season of LOST, it never truly leaves you for too long. Add on top of that the Blu-Ray release of seasons 1 and 2, so I've been trying to start my marathon viewing prior to season 6 (way behind on the LOST Re-Watch that has engulfed the LOST Blogosphere though). And of course, as much as I may annoy my new wife with my obsession, she still encourages it by letting me drink out of my DHARMA Station Pint Glasses every Wednesday (in honor of LOST) and even constructing a LOST Cake for the GROOM'S Cake at our wedding? Say what you will, but that tops anything that the Ace of Cakes Put together! Anyway, enough with updates on my LOST obsessed life! We're here to discuss Comic-Con 2009! Just like every other year, the Executive Producers of LOST (Damon Lindelof and Carlton Cuse) go into Radio Silence after the season finale until the massive Comic-Con event. This being their final panel at Comic-Con they pulled out all of the stops with lots of guests, funny bits and mind puzzling videos! (Although, I wonder if they reference the "CHER FAREWELL TOUR" comparison to indicate that it may NOT be their last comic-con panel.) Unfortunately, I wasn't able to attend the panel in person, but thank the inventor of TWITTER and YOUTUBE for making the world a small place! We have 4 video clips from the Comic-Con Panel below plus various other goodies that they unveiled to us. Naturally, we'll need to speculate what it all means. Without further adieu - The Comic-Con Clips! Props to Damon and Carlton for visiting the line that was camped out all night for the panel. They truly appreciate the fan dedication to their show. Also, Damon references having camped out for Comic-Con panels in his day too. Gotta love the NERDVANA of Comic-Con! Damon and Carlton supposedly lock away the final pages of the final script to prove that they are not making it up as they go along. They were going to reveal it on Jimmy Kimmel Live on the night of the series finale, but Josh Holloway, Michael Emerson, Jorge Garcia and Nestor Carbonell had other plans! (all present). But the end of the panel Emerson, insulting Josh Holloway's ability to read, takes the pages from the locked chest and reads them. Yup, they are pages for the ending of HEROES and not LOST. Classic! Season 6 will have a similar feel to Season 1 in terms of Tone and Adventure. Running through the jungle galore, a sense of discovery and unpredictability. Plus they promise we will see many characters we have not seen since season 1. (hmmm Boone, Walt? sure we've seen them but not much!) Note: Ian Somerhalder (Boone) did indicate he was asked to return in some form. I would guess it would be safe to say we'll see most of the main characters we've seen over the years in the final season in some way, shape or form. I mean, it's the final season! Funny bit with some comedian (can't remember his name) who drew a picture of Damon Carlton and a Polar Bear on velvet. Hysterical. He also referenced http://damoncarltonandapolarbear.com/ which I have yet to visit, but did verify it was a real site! Season 6 will feature a new storytelling device. We've had Flashbacks, Flashforwards and Time Travel to tell our stories. There will be something new for the final season but they didn't want to tip their hand. Theories anyone? Here's a crazy one. Perhaps the flashes will be to an alternate timeline with things that COULD HAVE BEEN had time been changed? I think that would get old after one episode though, so I doubt that's what they'll try to do. But it would certainly help explain the commercials they aired during comic-con. 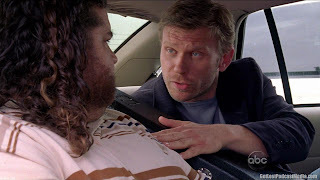 Jorge Garcia was introduced by acting as a questioner in line because Damon and Carlton wouldn't return his calls. It was hysterical. But he did ask the big questions. The commercials indicate that time was reset and seasons 1-5 never happened, thus upsetting everyone that has watched for 5 seasons. Damon and Carlton simply said "trust us" and that they wouldn't do something that would upset the fans that have dedicated their lives to watching LOST! Jorge makes a knock that Team Darlton also told him to trust them that Nikki and Paolo would be cool too. NICE. Producers indicated they would answer all questions that are important in the final season. Jorge asked if we'll ever find out what happened to Shannon's inhaler in season 1 when Sayid interrogated Sawyer for it. HYSTERICAL! Darlton indicated that Richard Alpert's back story is fairly involved in the Island's history so it's pretty safe to say we'll be seeing it. (Mentions of the Black Rock in the middle of the island were made too!) This just in, Nestor Carbonell has been announced as a series regular for the final season! Is the Man in Black's name ESAU? Emerson attempts to answer this by indicating people are being too literal with the Biblical reference, but he likes what they're thinking. Does Nestor Carbonell (Richard) wear eyeliner? Hysterical clip included in the videos above of Nestor applying the eyeliner and cursing out the people filming. Quote of the day "Richard Alpert is not Immortal, you are" as he looks in the mirror! While Team Darlton indicates that we won't be seeing much more DHARMA material on the MOTHERSHIP (the actual TV show LOST), they still plan on addressing the FOOD DROPS. But they reference the new online series MYSTERIES OF THE UNIVERSE that is being shown on ABC's website. They will reveal other DHARMA goodies on that. I watched the first one. Seems pretty cool! Has Jacob ever appeared to anyone as someone else? The answer is NO. So I'm still missing some clips. If anyone finds them, please share them in the comments and I'll add to this post. Hopefully, that helps everyone get their LOST fix for the time being! If not, check the next section! Thanks to Christian and the Super Secret Project for sharing their LOST FAN-THEM! Check it out guys, it's hysterical! Also, I'm on TWITTER NOW! I fought it for a long time but it has come in handy to get real-time updates from Comic-Con! I also thought it would be great to keep in touch with the Lost Addicts Blog readers for whenever new blogs are posted or immediate thoughts after an episode airs. And of course, once LOST is over, I certainly won't be done with my TV obsession. I'd be able to communicate my next project with everyone. So please, follow me on Twitter to stay tuned! I think I had more to share, but I just can't think of it right now. Look out for updates to this blog post throughout the next couple weeks if I find more updates. And please, I'd love to hear everyone's thoughts on what was revealed at Comic-Con or if anyone has developed new theories since LOST went on hiatus. I'll post a new blog post if we get any big updates from the producers (Season 6 trailers, Season 6 start date, etc..) As always, I hope you have enjoyed my ramblings and I'll see you probably in a couple months! NAMASTE! Hello Losties! 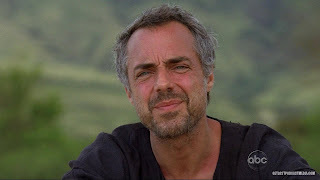 I'm sure many of you are annoyed at what happened on the last episode of LOST this season. All the hints were there from the producers and Benjamen Linus himself (Michael Emerson) that we might get a little frustrated at the end of the episode. But hey, there is only one season to go right? Season 6 - The season of Answers is on the brink of existence! In 8.5 months we may finally start to be able to piece this together. And in the meantime, we have plenty of juicy intel dumped onto us tonight to digest over those many months of LOST hibernation! Before we get too far into the blog, I wanted to welcome our viewers from the Tampa Bay area who may have seen me make a fool of myself on the local ABC Action News! Thinking more about the crazy theories I came up with LIVE on the air, I know that no one should be put under the gun immediately after a big episode airs because you may say something you regret! Anyway, for our readers around the globe that want to see this wonderful few minutes of my debut to the press, I will work on that over the next few weeks (or months). To the Tampa contingent, I promise you, you may get more out of my processed thoughts than my immediate ON-AIR thoughts so stick around and discuss with us! One word to sum up our Penultimate Finale to the GRAND FINALE Season next year....you know what it is! WOW!!!! I mean what didn't this episode have? Romance, Gun Fights, Explosions, ROSE AND BERNARD!!! !, Vincent, intriguing flashbacks, the Black Rock, the 4 toed statue in its entirety, a tidbit on Richard, information on John Locke, Marvin Candle/Pierre Chang's Hand injury, a scene with Sun and Jin together, Phil getting what he deserves!, someone shutting Radzinsky up for a brief moment in time, oh right and we met the almighty one known as JACOB! And the way he is introduced to us is quite intriguing! Let's not waste any time as this blog is going to be quite large (as all finale blogs are). As I always say, you have plenty of time during this off-season to read it! The Synopsis: In 1977, Jack is carrying out Daniel Faraday's mission to detonate the Hydrogen Bomb and prevent the Incident that inevitably brings Oceanic Flight 815 to the Island and causes 3 years of turmoil for the Island residents. Kate has been captured by DHARMA and put on the SUB with Juliet and Sawyer. Destination REAL WORLD! Hurley, Miles and Jin are still hanging around DHARMAVILLE trying to figure out what to do next. 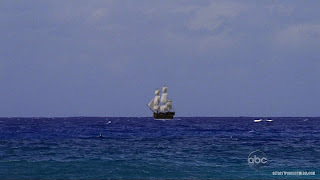 In 2007, John Locke is leading an expedition with Ben, Richard and all of the OTHERS to go see Jacob. His secret mission only revealed to Ben is to KILL Jacob. The Ajira 316 "Shadow of the Statue" crew are also on the move. Oh right, and then there is that little story of JACOB's big reveal in our Flashback scenes. Did Locke succeed with his mission? Was Jack able to alter the course of time? What exactly is Jacob and what has he been up to his whole life? Let's dive in and discuss! The first shot of Jacob we get is creating a tapestry of sorts. His location is a mystery at the time but there is a fire in the middle of the ancient room. Correction: We have a confirmed year of the Black Rock in season 4's "THE CONSTANT" dating around 1845. I was off only a couple hundred years! There is a mysterious man with Jacob talking to him about the ship. They discuss how Jacob BROUGHT them here. Based on what we see later, it seems like Jacob has been recruiting people to bring to the Island over various periods of time. But for what purpose? The Mysterious man talks about how it always ends the same way "They come, they fight, they destroy, they corrupt. It always ends the same way" Jacob says "It only ends once, anything before that is just progress" What on earth are they talking about? Are they talking about the various crews that have come to the island or are they talking about the BLACK ROCK crew specifically? Are they experiencing the Time Loop over and over again and retaining the memories from each loop? Is that what the man means by "always ends the same way" and what Jacob means by "it only ends once" and the events before is just progress towards that one ending? Was that the clue of all clues? Because the Come/Fight/Destroy/Corrupt could apply to DHARMA and the LOSTIES as well. So it could be more generic. But if it was a Time Loop, then why would the Jacob and the man pretend to not know why the Black Rock was showing up? And, if the producers are telling us that the TIME TRAVEL stories are in fact over for good, then are we really going to continue discussing this Time Loop? Also, if the Black Rock is sailing towards the Island, how on earth did it end up land locked in the middle of the Island when we see it in 2004? I just figured that at some point the Island was moved and the boat ended up marooned in the middle of the island when the Island showed up in its location. I guess there might be more to it. I believe we will be finding much more out about the Black Rock in season 6 as we are told it may hold some keys to the Island's secrets. This Man also tells Jacob that he wants to kill him. Jacob knows it. The man says he is going to find a "loophole" to be able to do it. Okay, what? So why won't he just kill Jacob right there? Is it similar to why Ben knew he couldn't kill Widmore in their off-island visit in season 4? And what is this Loophole? I mean, we sorta find out the solution to the loophole by the end of the episode, but we still don't know what it's all about. If it's a time loop, then I have some crazy ideas (one of which I shared without fully explaining myself on the Tampa news!) but we'll get to that later. Oh right, we found out that Jacob and Mystery Man were hanging out at the 4 toed Statue in its entirety! There were many speculations that the statue was the Egyptian God of the Underworld Anubis or the Egyptian Goddess of Fertility and Rebirth Taweret. It looks like the latter is the correct one. 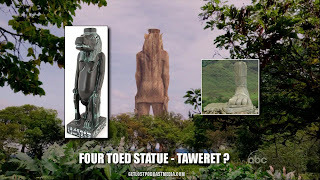 With the 2 Ankh's, one in each hand, which we had speculated before and the more rounded face, it seems like the statue is of Taweret. No pregnant belly though! So what does this signifiy? Well, we know that eventually there are fertility issues on the island and woman die during their pregnancies if they conceive on-island. Could this have something to do with the demise of the statue? We saw Juliet deliver a baby in 1977. But we never confirmed if that statue was still there in 1977. Could it be that "THE INCIDENT" caused the statue to crumble? Or was the comment of the Black Rock crew "DESTROYING" foreshadowing their part in destroying the statue? They sure left us with a lot of questions going into the final season of LOST didn't they?! I dunno, I'm still undecided if this think is Tawaret or Anubis though. I mean, this thing clearly doesn't have a belly! Don't get me started on the Crocodile God Sobek! While the face does look a little reptilian, I just don't think the LOST crew would make the 4 toed statue the Protector from Crocodiles! 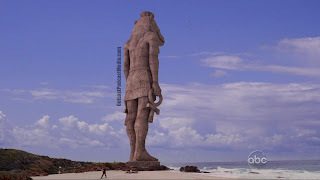 But the producers did say we would definitively be able to tell what the statue is by the end of the finale, so WHAT SAY YOU Lost Addicts Blog readers? Also we should note that Jacob was wearing a white shirt while his rival was wearing a black shirt. Ever since season 1 there has been this theme of black and white, light and dark. The black and white stones with the Adam and Eve skeletons, Locke's explanation of backgammon, etc... Even the name of the approaching ship is the "BLACK" Rock. Is this to suggest that Jacob is a force for good and this other man is a force for evil? Even possibly Smoke Monster related? Ahhhh....gotta love LOST! Does anyone remember way back in season 1 when the Kate-centric episode had us going back to finding out whose toy airplane she had robbed a bank for? It turned out to be her childhood friend Tom. They buried a Time Capsule in season 1 in a lunch box that had a tape of them having fun as kids, the toy airplane amongst other things. Well, apparently Jacob played a role in Kate getting the almighty New Kids on the Block lunch box! Boy Tom was carrying his toy plane while he stood guard when Kate shoplifted the lunchbox. They were caught by the store clerk. No Fear though, Jacob was there, appearing the same age as he did in the Black Rock era, offered to pay for it. He advised little Kate to never steal again and to be good. Which is ironic because older Kate staged a robbery just to get that crazy plane back. So did Jacob's interaction do anything to set Kate on a course of events that led her to become a fugitive and end up on Oceanic 815? It doesn't seem so on the surface, but going back to the first scene of the episode, it seemed like Jacob was watching over these people right from the beginning and controlling their destinies. I guess the big question is WHY? And, is this how the OTHERS were able to have so much detailed information on all of the survivors of 815? We started to believe that it was because Ben was aware that he lived with several of them for years in DHARMA times (Sawyer, Juliet, Miles, Jin). But if Jacob has been a mastermind and pulling all of the strings and making lists, that might make more sense. We are reminded of James "Sawyer" Ford's motivation to become the con-man that he is. John Locke's father conned his parents out of some money by seducing the mother. Sawyer's dad ended up killing mommy and then himself. We knew that the boy James wrote a letter to the real con-man Sawyer (Locke's father went by many aliases) that he carried with him his whole life so that he may one day read it to the man before he killed him. We see James at his parents' funeral. He stays back to begin writing the letter when his pen runs out of ink. Jacob is there to offer him a new one. He apologizes for the loss and continues on. A relative/friend of the family finds James' letter and tells him to not finish it and to move on. What's Done is Done. We know that Sawyer does go on to finish that letter and Locke sets up a meeting between his father and Sawyer in the Black Rock on the island. So Jacob, helped instigate the role that Sawyer would play for his entire life. That does seem to be meddling a bit doesn't it? When Sayid left the Island in January 2005 he found his true love Nadia and went to live a happy life until 10 months later, we see him in Iraq at Nadia's funeral. Ben meets him there and recruits Sayid to become an assasin and blames Charles Widmore as the man responsible for Nadia's death. We never did find out if Ben was speaking the truth or manipulating Sayid for personal gain. Our new scene shows Sayid and Nadia in Los Angeles enjoying each other's company and discussing their anniversary. They begin crossing an intersection. 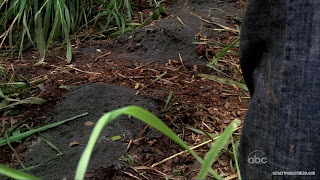 Jacob is there and claims to be lost and asks Sayid for directions. While asking for directions Nadia is hit be a vehicle and then the vehicle runs off. This scene is very similar to Season 3's "Not in Portland" where Juliet jokingly tells Richard Alpert that if her Ex-Husband was a hit by a bus, she might be able to take him up on his offer to do research for Mittlos BioSciene. Alas, we then see her Ex hit by a bus out of nowhere. Coincidence? Richard and Jacob both around for these events? And we must not forget about them bringing Anthony Cooper (Locke's Dad) to the Island via a car accident as well. What is up with THE OTHERS and spontaneous car accidents? Of course, we didn't get a look at the driver. Is it indeed the man working for Widmore that Ben pointed out to Sayid last season? Was Jacob really saving Sayid from sharing in Nadia's fate? But at the same time, ensuring that Sayid remained alive to travel back to the island and shoot Ben as a child? Yikes, anyone else have a headache? Nadia asks Sayid to take her home, this implying why they went back to Iraq for the funeral. We did not know much about Ilana's motivation going into this episode. We suspected that she was working for Ben Linus. We know she seduced Sayid and got him to board Ajira Flight 316 with her. Well our new scene is just as perplexing but at least we got more information on who she is working for. We find Ilana in a run-down hospital somewhere with her face all bandaged up. Jacob comes to see her and they clearly know each other. Jacob speaks in Russian apologizing that he wasn't there sooner. Ilana says that she is happy he is there. Jacob says he is there for her help and she agrees to help. Well what happened to Ilana? Why do they know each other? Was Ilana recruited by Jacob to get Sayid back to the Island as well as whatever other purpose she was asked to come to the island for? 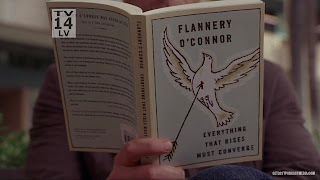 Jacob is sitting on a bench reading Flannery O'Connor's Everything That Rises Must Converge. The book is a collection of short stories that Flannery wrote during her final illness. Speculate at your leisure! We see John Locke fall from behind Jacob. Jacob, clearly expecting this to happen, casually puts his bookmark into the book and walks over to John. It appears that John is laying there lifeless until Jacob puts his hand on John's shoulder. John gasps for air as Jacob tells him "Don't worry everything is going to be alright. I'm sorry this happened to you"
Ummm......HUH? Does Jacob have healing powers? And if so, was he able to touch Locke to revive him but still manage to keep him paralyzed? 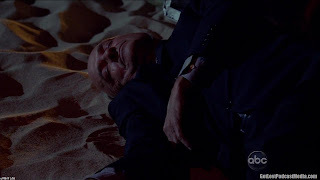 It has been spoken of in season 3 and 4 that that fall should have killed Locke, so it would seem that Jacob's intervention here was necessary for him to be alive. On-Island there is speculation to Jacob's involvement in Locke being alive after death as well, but we need to discuss that separately. There are also tie-ins to Richard's ageless mystery as well. The only scene this season that featured Jin and Sun together. Very fitting that it be their wedding. They exchange their vows. Jin's talks about them never ever being apart because it would be like the sky being apart from the earth. Yep, Jacob is there too. He offers a blessing in perfect Korean. "Your Love is a very special thing. Never take it for granted"
Something to note that I did not mention in the above flashbacks. Jacob touched each one of our Oceanic People. In the Kate Flashback, he touched her nose. Sawyer, they touched hands at the passing of the pen. Sayid, when Nadia was hit by the car, Jacob's hand goes to Sayid's shoulder. He touched Locke's shoulder. And when he gives the blessing he touches both Jin and Sun's arms. What does this signify? I have no idea, but it would be odd if it was merely coincidence. Also, he did not lay a hand on Ilana. We know this scene very well. In the Pilot episode Jack explains the scene when he rips a young girl's dural sack in his first solo surgery. He explained to Kate how he counted to 5 and it got rid of the nerves. We never know that it was his father Christian that instructed him to do the counting embarassing Jack in the process. In either case it worked. Jack then goes to the vending machine to try and get out an Apollo bar. It gets stuck. Christian comes out and explains that the crisis was averted and the girl is okay. Jack flips out on his dad claiming that he needs his team to believe in him especially with Christian being the Chief of Surgery. Jack claims Christian doesn't believe in him. Christian claims it was the other way around. Enter Jacob with 2 apollo bars. He asked if one was Jack's. They focus in on the hands as Jacob exchanges the bar to Jack and touches his hand. Jack looks at him funny and then awkwardly smiles. So do we think it's a coincidence that Jacob touched Locke and woke him up in his flashback and Jack's "future wife (at the time)" Sarah was paralyzed and Jack's surgery miraculously cured her? Do we think Jacob played a role in her recovery? Perhaps it goes back to this very moment where Jack and Jacob exchanged candy bars and touched hands? Seems pretty far fetched right now. But how else could Sarah have been cured? No Jacob involved in this one as far as I can tell. This shows Juliet and her Sister Rachel learning that her parents were getting divorced. This scene ties into a scene between her and Sawyer in the present day (well errrr 1977) which we aren't quite at yet! Juliet's mother explains that you just know when you're not supposed to be together and that she will understand when she's a grown-up. She refuses to understand as a child. But like I said, it ties into a later event! Ever since the episode "316" this season, we had some mysteries to tie up about how the Oceanic 5 + Ben got on the plane and what events transpired prior to them boarding that plane. All had been resolved except Hurley and the guitar case and Hurley's motivation to go to the Island. Hurley tries to convince the cops to keep him in jail but they continue to discharge him. When Hurley leaves to get in a cab, Jacob is in there with a guitar. Jacob tells Hurley that they can share the cab. When they depart Jacob tells Hurley he wasn't in jail and that he was waiting for him. He asked Hurley why he didn't want to go back to the island. Hurley goes into his speech of how he is cursed. He thinks the plane crashed because of him and the people died because of him. And now the ghosts visit him. (he's opening up to a stranger pretty easily about these ghosts!) Jacob claims that Hurley is blessed to be able to talk to people that he has lost. He tells Hurley that he is not crazy for seeing the Ghosts. Jacob never reveals who he is but tells Hurley where to be (Ajira 316) to get back to the Island and that the choice was his. As Jacob was leaving the cab, he touched Hurley, so the trend continues! Jacob claims that the guitar is not his. So then whose is it? Charlie's? I thought Jorge Garcia said we were going to find out about the guitar! All we found out was that it was in a car with Jacob and now Hurley has it. We don't even know what is in the case yet! Ugh...oh well, 8.5 months! The pilgrimage continues for John Locke, Ben Linus, Richard Alpert, Sun Kwon and the rest of the OTHERS to go see Jacob. 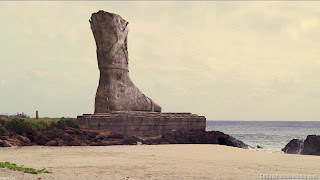 And we also follow the events of the Ajira "Shadow of the Statue" folk after they leave Hydra Island. Bram asks Ilana why they brought Frank (or "this yahoo" as he put it!) Ilana stated that the might need him. And they discussed the potential of him being a candidate. Hmmm what on earth are they talking about? Considering we know Ilana is working for Jacob could this be an equivalent to people on Jacob's lists? Frank was awake during Bram and Ilana's discussions and wondered who they are. Ilana states that they are friends. Bram states that they are the "GOOD GUYS" Loved Frank's line that people that have to state they're the good guys are usually the bad guys! Remember in season 2 when Ben told Michael that the others were The Good Guys, which he repeated to him in season 4. They decide to show Frank what is in the silver crate, and of course for now, keep it from us. But Frank's line "terrific" says it all! We'll wait until a little later for the unveiling! 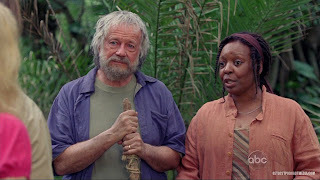 The crew continue their trek and arrive at Jacob's Cabin (which had most recently been inhabited by Christian and Claire but was built by Horace Goodspeed of the DHARMA Initiative). Bram and Frank have a discussion about what's in the crate. They said that they came to warn somebody that they know who they are up against which is a lot scarier that what's in the box. We do find out by the end of the episode who they need to show it to. Bram notes that there is a break in the continuous circle of Ash. What on earth does THAT mean? Ilana looked very concerned and clearly stepped "OVER" the ash. Perhaps it is there to note if intruders were in the premises of the cabin. Seems too simple a solution! Ilana goes into the cabin which is in shambles. Pictures on the floor, many of the cabin's possessions are no longer there. 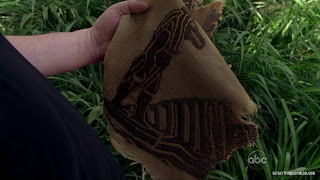 Except for a piece of what seems like tapestry that Ilana brings out to the crew. Ilana shows Bram what was in the cabin. Looks like they were given a message to head to the statue! Not sure if this cloth helps clarifiy if this is Tawaret or Sobek. But probably not Anubis! Before they head to the statue, the set the cabin on fire. Well, we didn't see Claire in there, so hopefully she is okay! Frank makes a note of setting the whole jungle on fire, but the Ajira folk do not seem concerned. We'll meet up with this crew a little later. Locke and crew keep trekking to Jacob. Lots of discussions happen on their way that we should probably...well...discuss! Sun asks Ben who Jacob is. Ben says he is the man in charge. That he once was and now Locke is the LEADER of the Others but the leader always reports to Jacob. Ben admitted to Sun to never meeting Jacob. I know that I have fallen for this before but in this episode especially, it seems like we can believe everything Ben is saying. He has reached an all-time low and is following Locke's orders based on Ghost-Daughter's appearance. Locke and Richard have an interesting discussion. Richard is curious to how Locke is alive if Ben strangled Locke. He said he has never seen anything like this. Locke says he has never seen anyone NOT age before. Richard says that he is that way BECAUSE OF JACOB which is why he thinks Locke is that way. So is that enough explanation folks? We clearly see that Jacob does not age and that he has some supernatural healing powers. Would this be enough to consider that Richard is ageless because of Jacob? Do we still wonder HOW this works? Of course we do! And for that we need to find out exactly WHO Jacob is. And I'm guessing that will be a tale told in Season 6. This episode was just a taste of it. But, if I were to connect the dots with last week's episode and Richard working on the Black Rock model and now we see Jacob was at the island PRIOR to the Black Rock's arrival, well I would like to declare with 51% certainty that Richard was a member of the Black Rock and NOT from ancient Egyptian times! Stay tuned for season 6! Locke says he agrees completely that is why he is out of the coffin, so that he can thank him. And then once they're done with him they need to "deal with" the rest of the Ajira passengers. Ahhh it's all coming together. This supposed Locke is at odds with any supporters of Jacob, which makes sense since he wants to kill him. I know I know, I'm getting ahead of mysefl! Later in the trek John and Ben had a discussion. Locke was surprised that Ben didn't tell Richard his plan to kill Jacob yet. Ben reveals the encounter with Ghost Alex and that he will do anything Locke says. Locke seems surprised by this encounter (but knowing what we know now...is he really??) but said it will be easier now to convince Ben to KILL Jacob. News that Ben didn't seem to take too well! Locke and crew then arrive to the Oceanic 815 camp which is in shambles like we saw it during the time jumps. We should note that we did not see in this episode the Ajira crew shooting at Time Jumping Sawyer, Juliet, Daniel, Locke, Charlotte and Miles rowing away in an outrigger. So, perhaps it was not the Ajira crew afterall? Surely, we'll see that scene next season! Locke says that they'll get where they are going by nightfall so that everyone should rest. They're going to need it. Locke and Ben have a discussion in front of the Hatch Quarantine door (tying in this time period to 1977. So, is this proof that Jack didn't succeed in the mission to stop the Swan Station from being created?) Locke notes that the hatch is where he and Ben first met. Awww how sweet! Locke asks about the day at the cabin when they first went to see Jacob. (Season 3's "The Man Behind the Curtain) Ben says that he was putting on a show, pretending, talking to an empty chair. He was embarassed that he couldn't see or talk to Jacob. But he was as shocked as Locke was when the place started going crazy and things started flying across the room. If you recall, Ben shot Locke in that episode and said it was because Locke "HEARD HIM." Hmmm that voice that said "HELP ME" certainly didn't sound like THIS Jacob that we met today did it? But regardless, it seems again that Locke is telling the truth. What does he have to lose right now? "Yes, I lied. That's what I do!" Ben asks why he wants Locke to kill Jacob. Locke does a pretty convincing job of wondering why Ben did NOT want to kill Jacob. Loyal service to the island, yet Ben gets cancer. Has to watch his daughter die in front of him, and is banished from the island. He did all this in the name of a man he never met. Tough not to talk about what we know about Locke just yet, but we must stay strong! 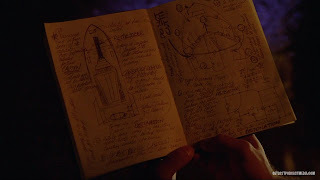 Sun is examining the camp and sees Aaron's cradle that Locke built for Claire's birthday in season 1. Was anyone else hoping that she'd find Charlie's Driveshaft ring before she even found it? Yeah, I was definitely glad to see it there! Here's what I don't get. Why, in season 2, did it take so long for Sayid, Jin and Sun to pass by the statue via Desmond/Libby's sailboat and here it took Locke and crew maybe a couple hours? Maybe I'm recalling the progression of events in the Season 2 Finale "Live Together Die Alone" but that seemed like it was very close to before they got to the North shore where they lit the signal for Jack and his crew that were following a "turned" Michael. I won't nitpick too much about it. But come on!!!! Now, based on what we know about Locke at the end of this episode, why was Locke ASKING about the statue. Shouldn't he already know about it? I guess he could be playing dumb. And I know I am getting ahead of myself again, but maybe part of Locke does live on in this new incarnation. It is now night and Locke continues to stare at the foot. Richard double checks with Locke one more time on if he wants to do this. "If you waited, Jacob would eventually have come to you" Locke is tired of waiting. Sun asked Ben what happened to the rest of the statue. Ben said, I don't know it was like that when I got here. Sun says "Do you expect me to believe that?" Ben's answer was priceless "Not Really." So I guess this is a pretty big question, WAS the statue there in DHARMA Times? Because it might have been destroyed by THE INCIDENT and causing fertility issues on the Island ever since (I mean, yes, I know logically speaking that sounds ridiculous, but we are on an Island of ageless wonders and smoke monsters!) Of course, we don't know if we can believe Ben or not because he's not talking to All-Knowing Locke. Richard and Locke head to the foot and Locke asks Ben to come along which causes a disturbance. Richard, frustrated, said there can only be one leader at a time! Locke says he thinks that Richard is just making these rules up as he goes along. He says Ben is coming in and he and Jacob will work it out. 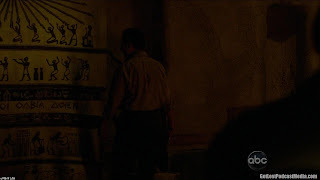 Richard opens a secret door in the foot of the statue and sends Locke and Ben in. Well, who would have thought that there was more INSIDE the statue?! Crazy! Richard says "Tell him I said hello" and then leaves Locke and Ben to the rest of their quest. Locke asks Ben if he's ready to do this. He knows it won't be easy but things will change once he's gone. He promises. Ben takes the knife and they head in. Meanwhile, outside the Ajira folk arrive to the statue. Guns pointed everywhere. A crazy reveal is on the way! Ilana and crew bring in the crate and come in peace. They drop their guns. She asks which one is Ricardos (if you remember, that is how Juliet said Richard's name in Latin back in the 3rd episode of the season "Jughead"). "It's Richard actually" Richard steps up to face them. The question is asked one more time. "What Lies in the Shadow of the statue?" Richard has an answer! Thank God! "Ille qui nos omnes servabit" is the answer in Latin. I found 2 different translations on the net which pretty much equate to the same thing. "He who will Protect us all" or "He who will save us all" Well, we now know that Jacob lives WITHIN the statue. So is it safe to say that this is the secret handshake between Jacob's followers? Ilana is pleased with the answer and introduces herself. We find out that Richard was the one they came to see. She orders the crate be opened up. You ready for this guys? It's a dead body that they found in the cargo hold of the plane. Yup, in a COFFIN! It's John Locke! Sun asks if THIS is Locke, then who is the man they have been following? A good question indeed Sun! Good question! Let's move on before we discuss. Ben and Locke head down the hallway into the main chamber. The chamber turns out to be the same place that we saw in the beginning of the episode where we saw Jacob sewing and creating a tapestry, which hundreds of years later is now complete. The other big difference would be the giant hole in the ceiling where the rest of the statue used to be. Jacob asks Ben if he likes the tapestry and says he made it himself. It took a very long time since he was making the thread, but that was the point. Locke says hello to Jacob to which he responds, "Well you found your loophole" "Indeed I did" Woaaaaaaaaaa it's the man in black from the beginning that said he wanted to kill Jacob! Wait a sec, but is it? Locke seems to have all of the knowledge and memories of his prior self, of his relationship with Ben and Sun. But at the same time, he has seemed a bit off and a little TOO all-knowing right? So is this a hybrid of Locke and Jacob's Rival? Or is it strictly Jacob's rival with all of the memories of Locke via a timeloop? Having lived things over and over again to the point where both he and Jacob are aware of EVERYTHING that has happened on the island and know it by memory? He found a LOOPHOLE of sorts. What has this man been up to? Why did he have to be LOCKE in order to get to Jacob and still enlist Ben to kill him? Was he killed in the past and somehow is reincarnated in Lockean form? Was he excommunicated from the Island? What is this loophole? I want to know!! And when did these events start for John Locke? Was it Christian Shephard residing in the cabin that sent Locke on this path? 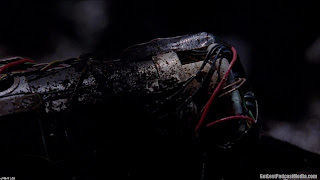 We have seen him tied to the smoke monster and he also told Locke that he would have to die "That's why it is called sacrifice" Now I came up with a crazy theory on the news last night that maybe Christian Shephard is JACOB finding a loophole back to the Island via Shephard's body on Flight 815. It's crazy and out there I know and only make sense if the Timeloop theory is correct. But then if that was the case, would Jacob as Shephard have sent Locke to move the Island which eventually led to him leaving the island to be killed by Ben which would bring Man in Black as Locke to the Island? Ahhhhh so confusing. I'm sure there's a simple explanation to it all. But for now, all we have is theories and discussion! Moving on, Bizarro Locke tells Jacob "you have no idea what I have gone through to be here" Ben is confused and asks if they have met before. B. Locke says "in a manner of speaking" and then asks Ben to do what he asked him to do. Jacob tells Ben that whatever Bizarro Locke told Ben that he still has a choice. Do what he asks or he can go and leave them to discuss their "issues." Well this really sets Ben off! After all of this time he is no longer being ignored by Jacob. He lived on the island for 35 years and only heard of Jacob's name. Richard would bring instructions and LISTS from Jacob with empty promises that "You have to wait. Be patient". He never questioned anything. But Locke asks to come here and gets marched in as if he's Moses. "Why him? What was so wrong with me? What about me?" Jacob answers coyly back. "What about you?" Ben loses it, takes out the knife and goes nuts stabbing Jacob multiple times a la what he did to Keamy last season! Jacob is spitting up blood and says "They're coming" 2 times. Who is coming? The Ajira people? The Others? Someone else that only Jacob and Bizarro Locke know about? Regardless, Locke rolls Jacob into the fire and ignites him. RIP Jacob??? Hmmm, I'm not so sure yet. But, we're going to have to wait until next season to see what is going on. In the meantime, I would love to hear all of your thoughts! BTW my Christian is a reincarnation of Jacob theory? Ugh, I think I'm still regretting going down that path during the news interview. But I'm sure it made for entertaining TV! It just seems so crazy that Jacob has been around for so long and we are just introduced to him now for him to be completely dead. But we'll see! Let's see how well Jack and crew fared! Kate explains to Sawyer and Juliet that Jack is planning to blow up Jughead in order to change their destinies. Kate is concerned for the people on the island. Sawyer doesn't seem to care. He is still angry that Jack and crew returned and messed up the great thing they had going. And he is content with not worrying about the people on the island's fate. I spoke too soon last week with them not drugging the sub passengers. The sub crew were getting ready to hand out the sedative and OJ prior to heading on their "Island Exit Bearing" So much for the Looking Glass Station being involved with transportation to and from the island! Juliet takes matters into her own hands and knocks out the DRUG MAN! She says that they BOTH made a decision to the leave the Island and now they are going back. They can't just let the people die. Sawyer gives in and Juliet uncuffs them all from Drug Guy's keys. The sub captain communicates that they are ready to head on the bearing. (communicating with Looking Glass or Flame? Doesn't matter? Okay, I'll roll with it.) They call the sub the Galaga. I think that might be the first time we heard the name. 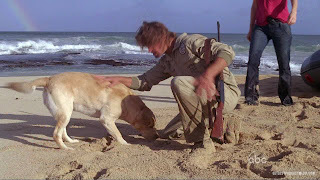 Sawyer and crew take Captain at gunpoint asking them to surface and let them off. And make sure that they do not bring the rest of the people back to the Island. Sawyer shoots the communication to make sure he doesn't have to talk to anyone and explain what has happened. The sub surfaces and our heroes get off in a Raft (hmmm that was convenient! I guess it's standard safety procedure to have them on board! Radzinsky explaining to Chang that he came here to make a difference in the world and harness electromagnetic energy like it has never been used before. Radzinsky realizing that Sayid (the Hostile) is involved and knows about the Swan which gets them ready for the showdown. The drilling is getting very close to the pocket and the drill is heating up. Chang is very concerned that all hell is going to break loose. We last left Jack, Sayid, Richard and Eloise in the tunnels with Jughead trying to figure out what to do next. Anyway, Sayid begins to work his magic and removes the core. It is also revealed that Eloise is pregnant, which we suspected last week with Charles talking about her condition. Eloise mentions this is EXACTLY the reason they have to do what Jack and Sayid want to do. Sayid said they had 2 hours, which shocked Jack. Really Jack? Daniel mentioned before he died that the Incident would occur in 4 hours! Anyway Sayid gave Jack a refresher that Daniel was very explicit about his time table when he returned to the island. The big question is, how did Daniel KNOW when all of these events were going to happen and when? He even knew when Chang was showing up to the Orchid. Would this be a result of his own time traveling which we have yet to see? Or are we just supposed to accept on good faith that his research led to these exact times? A little later, Sayid has the core in a backpack and they are on the move. Richard finds a hollow wall and takes a sledgehammer to it. They see the basement of one of the DHARMA houses. So they literally did build this place into the tunnels. Which explains the ancient door in Ben's house (which may have been Horace's?). The question is did DHARMA use the tunnels? We know that Radzinsky was aware of them when he drew the map in the Swan Hatch. Lots of squabbling occurs about who is in charge. Eloise or Jack. But eventually Richard knocks Eloise out as he is not thrilled about helping them in the first place. He tells Jack and Sayid to continue on their own which they oblige. They are in the middle of DHARMAVILLE and need to figure out how to get out of there without being noticed. Sayid puts on Horace's jumpsuit (guess that means they were in Horace's house!) and they plan on passing by as regular DHARMA folk. The alarms are going crazy as DHARMA is on alert looking for Jack and crew. No fear, Ben linus recognizes Sayid as the man who shot his son! It's payback time! He shoots Sayid in the gut and an all out gunfight starts. Jack goes nuts firing his little pistol at all of the rifle bearing DHARMA folk. He actually does shoot one or two of them. They get behind one of the DHARMA houses for cover. As they are trying to make a run for it Hurley, Jin and Miles show up with the DHARMA van pull them in and rescue them! WHEW! They instruct Hurley to drive to the Swan. Jack says if they want to save Sayid they need to go to the SWAN. Yet again he is hoping that none of this even matters. The people he was killing in DHARMAVILLE, Daniel Dying, Sayid being shot. It can all be reset as long as they set off that bomb in the pocket of electromagnetic energy. Jack tells Jin he thinks he found a way to get him back to his wife. We'll save our theorizing until the end! Miles asks if this is going to set them back in time. Jack says they are not going BACK in time. He apparently is just hoping that this version of them will not exist anymore and their lives will have gone on for 3 years as if they didn't crash on the Island. Yikes. Sawyer, Juliet and Kate row to shore trying to figure out what way is North, West and such and such. Kate uses her knowledge of suns setting in the West to figure out where they were. But Sawyer asks if she had a compass anyway. Juliet is not too pleased at Kate and Sawyer's chumminess. Let's not even get into the fact that on the Island the light "scatters differently" according to Daniel Faraday. But I don't think that comes into play here as they do find where they are going. The arrive on the shore. Kate thanks Juliet for backing her up at the sub. You can tell Juliet is thrilled about the situation! A friendly face arrives to greet them. It's Vincent!! The producers have stated that Vincent will indeed survive to the end of the series. Exciting stuff! And that's not the only people that are there. Nope, Rose and Bernard reluctantly come out to greet them. Rose: "Ohhhhh HELLLL no! They found us" Bearded Bernard: "Son of a B#$%&!" Apparently while the Others easily heard Sawyer screaming to meet at the creek in 1954, Rose and Bernard were too occupied with the flaming arrows to hear them. We found out that Jin searching the grids in "LaFleur" was in search of any other survivors that were time jumping with them. Rose and Bernard were aware of the searches and purposely avoided them. They are officially "RETIRED." They didn't want to be assimilated into the DHARMA Initiative. They grabbed food from DHARMA and created their own little residence by the ocean. Nice! Juliet asks which way the DHARMA barracks are and they get their direction. Farewell Rose and Bernard! I think. So, let's say that Jack and crew do not succeed in resetting the clock and whatever they do at the Swan caused them to travel back to 2007, do Rose and Bernard go with them or do they stay in the 70's? Were they outside of any radius that would have shipped them back? My point being. If they do remain in the 70's there is still a chance that they could be the Adam and Eve skeletons in the cave. Of course, they still need to acquire black and white stones and move to the caves for some reason. Maybe that is a failed theory, but I still think it makes sense! A couple living on their own, happily on an island. It just fits the scenario we saw in the caves early in season 1. We'll see! Sawyer, Juliet and Kate head on their way to stop Jack! Sayid wants to rework the bomb so that it can be detonated upon impact. He specifies that this has to happen at the exact moment of the incident or that this will all be for nothing. The van comes to a halt. Sawyer, Kate and Juliet bearing weapons are blocking the way! Sawyer asks for 5 minutes alone with Jack. Jack reluctantly obliges after some convincing. Jack and Sawyer sit down and have a chat. This is very reminiscent of the scene between Jack and Sawyer in season 1 when Sawyer brings up his encounter with Christian Shephard in Sydney. Sawyer begins to explain how his parents died. The Conman, the Murder-Suicide. He explains how it happened a year ago from where they are now 1976 but he didn't leave the island to stop it. What's Done is Done he says (similar to what the man told him in his flashback, similar to what he said earlier this season as well). Sidenote: we find out it's July 1977. So Star Wars IS out in theaters! Saywer demands to know what he screwed up so badly that they have to change things. Jack says that 3 years go Locke told him that all of this was happening for a reason. That it was their destiny. Sawyer had a classic line "I don't speak destiny!" A man does something because he wants something for himself. What does Jack want? "I had her and I lost her"
Sawyer is confused why Jack can't just tell Kate now. And they wouldn't even know each other if the plane landed in Los Angeles. Plus Kate was a fugitive. Jack talks about destiny again with "if it's meant to be it will happen." Hmmm so I guess he still thinks he will end up on the Island even if the plane lands in Los Angeles? Jack says it's too late to get Kate back. and that Sawyer's 5 minute is up. Sawyer gives up rationalizing and starts a fist fight. 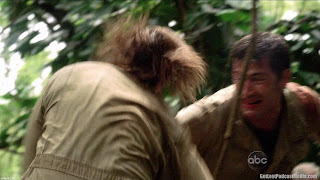 And believe it or not, this is really the first time we have seen Jack and Sawyer in a fight! They are pretty evently matched for awhile, but Sawyer gets the upper hand and is ready to strangle Jack. He asks if Jack will stop and when Jack says no, Sawyer begins to beat his face in. That is, until Juliet stops it. Juliet changed her mind to Sawyer's frustration. She now thinks that Jack HAS to do this. Long story short, Juliet changed her mind when he saw Sawyer look at Kate. He has never gotten over her. (that's cool, neither has Jack! Back to square 1!) Juliet thought that they love each other and Sawyer would never leave her if she let him. Just because they love each other doesn't mean they were meant to be together. So if Jack can make it so they never came there, maybe it is for the best. "If I never meet you, then I never have to lose you" Ouch, that's quite a breakup! Meanwhile Jack and Kate have a moment near the Swan station. Kate tends to Jack asking if he remembers when she first sewed him up (Pilot episode). Seems like a million years ago. Kate: or 30 years from now! Nice. Jack asked about the promise he made to Kate about not asking about Aaron. Kate was mad at Jack for bringing her back at the time. But now she explains she came back for Claire. Jack tries to convince her that if they stop the plane from ever crashing that Claire would land in Los Angeles. And maybe she wouldn't give up Aaron for adoption. What's meant to be is meant to be. Whew, I really hope this isn't how season 6 starts! Jack explains that nothing in his life has ever felt so right. He needs Kate to believe that. They see smoke coming up from the Drill site. Jack knows it's about to happen. He asks if Kate is with them. If you recall from earlier this season Kate told Jack "I have always been with you" and once again she agrees to go with Jack. Here we go again! For good, worse or better the band is back together! Sayid tells Jack that the bomb is all set to go. According to Faraday, the bomb must be as close to the source of the electromagnetism. Jack assures Sayid that this is going to work and save him. 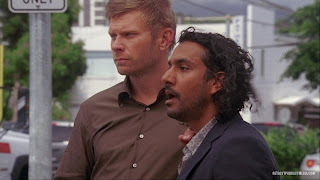 Sayid assures Jack that nothing can save him (I would guess from all of his past sins he has committed). Jack loads up the bomb on his back, takes one longing look at Kate and then moves on alone. Runs into Sawyer and Juliet. "See you in Los Angeles"
Meanwhile Miles asks everyone to think about this the other way (as we have been discussing for weeks!). What if the explosion is exactly what causes the Incident in the first place? What if the best thing to do would be to do NOTHING at all? No one says anything. Another classic line. "Well I'm glad you all thought this through." Back with Jack. There are guards at every point. Jack is sneaking his way in. But inevitably he gets caught in gunfire. Naturally it's annoying Phil that finds him! When all hope seems lost the DHARMA van full of our friends drive in opening the door and opening fire on Radzinsky and crew! An intense gun battle ensues. Kate gets some guards up top. Sawyer runs in and knocks Radzinsky out and takes Phil hostage! Time for some payback for slapping Juliet! Our LOSTIES head in. Jack heads in to drop the bomb. They tell chang to turn the drill off. But it won't shut down. They hit the pocket and the magnetism is pulling the drill in. It's time! Jack looks at Kate again, she's crying but nods him along. Sawyer looks at Juliet, she smiles. Jack drops the bomb. They brace for something to happen. And....nothing. Then the Electro-magnetic event similar to season 2 begins. Sawyer - "This don't look like LAX!" All metal objects begin getting pulled into the hole. 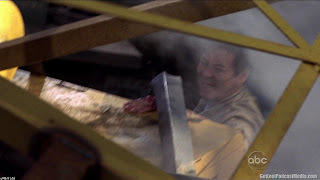 Chang's hand gets caught under metal. If you recall, he has a Prosthetic hand in the DHARMA SWAN Orientation Film. Is this the cause of it? And is that enough to prove that nothing has changed? Miles rescues his father and tells him to get as far away as possible. Radzinsky flees but the jeep is getting pulled in. Phil was getting ready to kill Sawyer and he gets stabbed by some debris! YES!!!! The rest of DHARMA seems to get away as they should. But Juliet gets wrapped in chains and pulled into the hole. Kate and Sawyer try to hold on and grab her. Juliet hangs on for awhile, crying but eventually gives in. 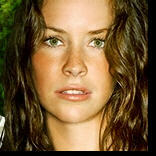 She professes her love for Sawyer and falls many many feet to her supposed death. (The V - TV Series Remake calling?). Cue tears. The metal is still being pulled in. Jack shakes off being knocked semi-unconscious. Kate is trying to pull off Sawyer from his sobbing on the top of the drill site. The drill gets pulled into the hole and we follow it down to see Juliet still there and still alive. But not in good shape. She's bloody and crying. She sees that the bomb was never detonated. It's still there. She finds a rock and decides to start banging at it. "COME ON!!!! COME ON!!!!!" "COME ON YOU SON OF A BIIIII#$#$"
NOOOOOOOOO!!!!!!!!!!!! That's where they leave us? You bet they do. And with a nice reverse color LOST title! Nice. I personally think there was enough shown to us that a complete reset is out of the realm of possibility. But it sure wasn't factored out indefinitely as was nothing! So what happened? Did Sayid and Juliet survive? Are they moved back to the same 2007 that Bizarro Locke, Sun, Ben and Frank are? Obviously that version of 2007 showed that the Oceanic Crew DID indeed reside there. We saw Charlie's ring for proof. Would they really leave these events hanging on us the way they stood and then reset time so that it never happened? Or would there be some type of major course correction to insure that the hatch is STILL built and that events transpire as they are supposed to. I'm willing to agree with Miles. They did exactly what they were always intended to do. So then the question is, who survives and where/when are they? Of course, you throw in the Infinite Time Loop possibility and the Loophole, and maybe this was part of it. Maybe we are seeing them participate in said Loophole. I don't know but I sure am psyched for 8.5 months from now to find out. And I'd love to hear your theories on the matter. Who/What is the Smoke Monster? Who/What is Christian Shephard's entity on the island? Who are the Adam and Eve Skeletons and how did they end up there? What is the story with the Black Rock and Jacob's involvement with it? Why did Jacob recruit the Oceanic people for the Island? What are the dreams and visions all about? What are the ghosts all about? Why can Hurley communicate with the dead? Are they REALLY the actual people that died or some other version of them? What about Miles speaking to the dead? What is at the Temple? What IS the Temple? Who will Kate end up with? Or will she end up dead? Will Jack have to perform an ultimate sacrifice at the end of the show and be a tragic hero? What is up with Walt's powers? Will he return to the Island and reconcile with a possible Ghost Dad? Or will Michael be alive in an alternate timeline. Already dismissed by producers as not prominent, what was up with Libby at Hurley's Mental Institution? And is her husband David the same DAVE that was haunting Hurley's imagination? Will we get to see all of our fallen 815ers again in season 6? What is up with people not being able to be killed until their TASKS ARE DONE on the Island? Jack couldn't kill himself, Neither could Michael. Gunshots would go right through certain people. Man, I could go on forever, but I'll save some for the comments! Whew, I promised it would be a long blog and we have plenty of time to read and dissect. I am sorry for the long delay in getting the blog up. But I hope you have enjoyed my ramblings! Tune in this summer for occassional posts whenever we get some news from the producers. I'm guessing the first one will be after Comic-Con in July! Thanks everyone for all of your support with the blog, and welcome to all new readers! Please stick around and join into the discussion. We have 17 episodes left and a lot of questions to be answered. Let's not let the producers forget what the questions are! DISCUSS AWAY folks. I'll see you next year and NAMASTE! Special thanks for Get Lost Podcast Media, for providing the amazing screen shots from the episode on their site. They have loads of them!